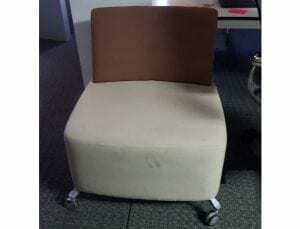 We currently have these used Orangebox Path Reception Chairs with lockable castors in stock. Each product comes in cream/beige with light brown back. You can take a more detailed look at these products by clicking on the images on the left hand side of this page. If you would like to purchase these products, you can get in touch with one of our sales team by calling 07944 508282, or you can fill out our Request a Quote Online Form. If you are viewing our website using a Mobile Device, you can click on the Telephone Icon located at the bottom of the page. Lockable castors, cream/beige base with light brown back.